I recently took a little trip to the beach, which of course meant I got to read a little more in a short period of time than normal. One of these books, which I read from start to finish in a single day was Shades of Milk and Honey by Mary Robinette Kowal. This book has been on my radar for a while now since I’ve listened to Kowal on the Writing Excuses podcast, but when Charlene fangirled over the entire Glamourist Histories series, it piqued my interest even more. It reads like Jane Austen… but more accessible. If you know me, it’s no secret that I’m a fan of Jane Austen’s stories, but I do struggle with her writing style (which is 99% due to the time period she lived in). This is like reading about Jane Austen’s time period and with her stories’ sensibilities with modern accessibility, while staying true to Austen’s tone. Plus magic. I really liked Jane a lot. She’s smart, great at glamour (referring to magic, not putting together her look, though that can be part of it), and is just a good person. She cares about the friends and family in her life so genuinely but she isn’t afraid to stand up for what’s right, even if that means it might temporarily hurt someone she cares about. Her relationship with her sister Melody is a big focus in the story, and while I don’t know anything about having a sister ten years younger than me, I felt the up’s and down’s of their relationship seemed realistic; they care for each other but the age difference (and other general differences) do cause friction between them. And any time Jane feels this friction, she hopes to fix it. The other characters… even when they drove me a little crazy. Akin to the characterization in Jane Austen’s books, Kowal’s MC Jane is the most sane person around (well, in addition to her father and misunderstood love interest). Jane’s mother is so much a Mrs. Bennett, and then of course there were the uppity gossips, people with tragic pasts that blinded them to sense, etc. Yet despite the fact they aren’t the best people and are very much based off of Jane Austen character archetypes, I still found them well-rounded and interesting to read about. The romance read like Jane Austen… meaning a little too downplayed. The romance just felt a smidge rushed. The characters vaguely know each other the entire book, but by the end they’re married. When Vincent proposes to Jane, they have barely had a civil conversation. Now, Jane does make the statement that because she knows his art/glamour she essentially knows him, which I get, but I still think maybe they could have had a short courtship or at least one semi-romantic moment together before I could fully buy that they were ready for marriage like a week later. I do like them together and think it plays out nicely, but I needed just a *little* bit more! Since everything else felt so much like Jane Austen, even the magic somehow fit in nicely, I was a little shocked by the crazy action-packed ending that didn’t feel very Regency-era to me. Yes, duels were a thing back then, but it still felt a little out of left field for me, most particularly the threats that are lobbed at Jane by the Willoughby-esque character. Moments that were unresolved or TOO resolved. Now I’m getting nit-picky and these shouldn’t really hinder anyone’s enjoyment of the book, but I felt like mentioning them. There are two things that stand out to me as unresolved: one was a very minor thematic element and the other is the title. 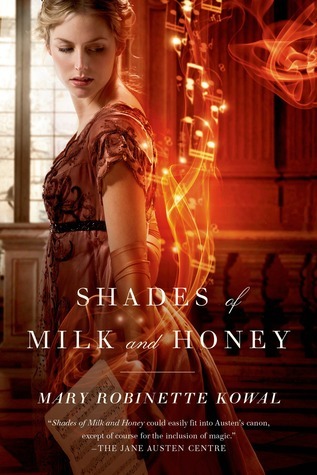 Let me tackle the latter first: I have no idea why this book is titled Shades of Milk and Honey and it bothers me. I like to feel like I caught the title’s reference, even if the exact words aren’t in the story, but I’m clueless on this one. Also, there is this minor element of the story where Mr. Ellsworth is requesting Jane wear certain things, but I never saw an explanation as to why he requested those certain things. Maybe it was just the general sentiment to catch a husband, but I expected that the requests were specific for a reason but I never understand why. On the other end of the spectrum, the ending was way too specific and resolved. I’m sure this book was sold as a standlone with series potential and Kowal wanted her readers to be assured of the happily ever after, but even if I didn’t know there were four more books I think I still would have been like, “OK, I don’t need to know about Melody’s wedding AND the Ellsworth grandchildren AND Jane + Vincent in their old age.” All this is only a few paragraphs, but I would have preferred the book simply resolve with knowing Jane and Vincent got married and were going to travel to do glamour work, the end. Then I can draw my own conclusions or read on. You’re looking for a good adult fiction read. You’re a fan of Jane Austen stories. You’re a fan of a little magic in the everyday. I highly recommend Shades of Milk and Honey! If you’ve read Shades of Milk and Honey, what are your thoughts? I definitely feel like I’m due for a re-reread of this book! Especially after having finished the series, and getting a bit more perspective on where the series is going. I forgot the first book had a pretty complete ending. I wonder if the author had an idea already for what happens next even if she wasn’t sure the publishers would pick it up for another series. I totally get you on the rushed romance too – it was pretty surprising to see where it went in this book. I’m so happy you got the next books in the series though (as I saw on your insta!) I hope you love them! I’m intrigued to see how the romance is in the second book then!